The 25OHD-balancing effects Dai et al. observed in their 180 participants (aged 40–85 y) could after all do much more than point towards a reason why everyone and his mama seems to be D-ficient – it could force us to redefine what “optimal” 25OHD levels are – significantly below those many Internet “health experts” recommend. The study is a National Cancer Institute independently funded ancillary study, nested within the “Personalized Prevention of Colorectal Cancer Trial” (PPCCT), which enrolled 250 participants at risk of developing colorectal cancer. The PPCCT is a double-blind 2 × 2 factorial randomized controlled trial conducted in the Vanderbilt University Medical Center. What makes the study stick out is that doses for both magnesium and placebo were customized based on baseline dietary intakes – in other words: The less magnesium in the diet, the more was supplemented. Furthermore, the scientists tested not just 25OHD (which is what your doctor will test if you ask for a “vitamin D test”) but also changes in plasma 25-hydroxyvitamin D3 [25(OH)D3], 25-hydroxyvitamin D2 [25(OH)D2], 1,25-dihydroxyvitamin D3, 1,25-dihydroxyvitamin D2, and 24,25-dihydroxyvitamin D3 [24,25(OH)2D3] – all by liquid chromatography–mass spectrometry. Based on the somewhat disappointing observation that vitamin D was not related to cardiovascular disease in the recent VITAL trial (Kubiak 2018) – even in subjects with baseline vitamin D insufficiency(!) – the researchers whose current main objective is to elucidate the role that magnesium may play with cancer as part of the previously mentioned “Personalized Prevention of Colorectal Cancer Trial” speculated that “magnesium supplementation differentially affects vitamin D metabolism dependent on baseline 25-hydroxyvitamin D [25(OH)D] concentration” (Dai 2018). In previous experiments, the scientists had already observed that people’s ability to synthesize “vitamin D” depended on their magnesium status. “Vitamin D insufficiency is something that has been recognized as a potential health problem on a fairly large scale in the U.S. A lot of people have received recommendations from their health care providers to take vitamin D supplements to increase their levels based upon their blood tests. Incidentally, the hypothesis that these two deficiency nutrients may interact is not even new. You can go back as far as 50 years and will find (rodent) studies showing how vitamin D affects not just calcium but also magnesium levels (Harrison 1964). Hitherto, though, this interaction has often been ascribed to the ability of vitamin D to increase Mg absorption irrespective of one’s vitamin D status. Having high(er) 25OHD levels was found to be associated with 11-13% reduced all-cause mortality hazards in a 2013 study using data from NHANES 2001-06 – for those of the subjects that consumed high(er) amounts of magnesium the hazard reduction compared to D-ficient levels of <20ng/ml was 23%-30% and the overall HRs up to 20% lower (Deng 2013). The opposite, i.e. putative effect of magnesium on vitamin D, on the other hand, has been largely ignored – despite the fact that more recent studies, such as Deng et al. 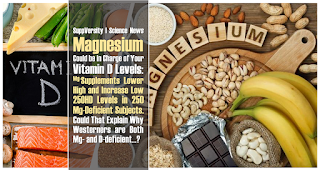 2013, in which the authors analyzed NHANES data from 2001 to 2006 seem to suggest that there’s a two-way interaction of magnesium and vitamin D in relation to risk of both vitamin D deficiency and insufficiency – with literally life-threatening/saving implications (Deng 2013). Which Mg is best? Plasma an bone (primary axis) as well as red blood cell (RBC; 2ndary axis(!)) content after 14 days of supplementation with identical amounts of magnesium in different organic and inorganic forms (Coudray. 2005 | learn more) – unfortunately, the study was conducted in rodents and used only gluconate, not glycinate as it was used in the PPCT trial. Now, we shouldn’t forget that, in Deng’s study, we’re talking about correlations/associations of which Zittermann in a 2013 writes that it “provides important findings concerning potential metabolic interactions between magnesium and vitamin D and its clinical relevance. In 10 lab-workers, the mean serum 25(OH)D varied widely [from 17.1 (4.6) to 35.6 (5.2) ng/ml; P < 0.005] between laboratories (error bars represent SEM). B, Similarly, marked within-individual variation was observed in 25(OH)D measurement in different laboratories. This means: Whether an individual has hypovitaminosis D (threshold = dashed line) depends on which laboratory was used. I’ve heard the vitamin D test is inaccurate – Is that accurate or #fakeNews? Accurate. As Holick points out in a 2009 paper, “the first assays for 25(OH)D used the competitive protein binding format with the vitamin D binding protein (DBP) as the binder” – advantage: recognizes 25(OH)D2 equally as well as 25(OH)D3; disadvantage: the assay will also measure all sorts of D-metabolites including 24,25-dihydroxyvitamin D [24,25(OH)2D], 25,26-dihydroxyvitamin D and the 25,26-dihydroxyvitamin D -26, 23-lactone, which reduces the accuracy by ~10-15%. So how do you get the absolute accurate levels? You don’t… well, actually you don’t have to. Scientists, on the other hand, should use liquid chromatography tandem mass spectroscopy (LC-MS) to measure 25(OH)D in human serum, directly. This assay quantitatively measures both 25(OH)D2 and 25(OH)D3. However, results should be considered preliminary since biochemical data on individual magnesium status were lacking, [and] confounding cannot be excluded” (Zittermann 2013). That’s in contrast to the more recent observations by Dai et al. whose data come from a tightly controlled clinical trial – a trial that clearly suggests this link could be mechanistic. Overall, the provision of (sufficient =RDA) magnesium seems, as the authors from Vanderbilt University rightly point out, to allow our bodies to keep our 25OHD levels within the middle range of a previously established and repeatedly confirmed U-shaped curve that illustrates the general or specific cardiovascular disease risk as a function of serum 25OHD levels (Ross 2011; Abraham 2011). Somewhat surprising for the “more is more” proponents, high 25OHD3 and 24,25(OH)2D3 decreased with magnesium supplementation; the often derided 25(OH)D2, on the other hand, increased (Dai 2018). In the discussion of the results, Dai et al. (2018) write that “magnesium supplementation may not only accelerate the metabolism and degradation of 25(OH)D3 but also shift CYP3A4 to selectively degrade vitamin D3 over vitamin D2 when plasma 25(OH)D is high” – it doesn’t take a scientists to realize that the findings of the study at hand thus “provide the first evidence that adequate magnesium status could potentially prevent vitamin D–related adverse events” (Dai 2018). The existence of such a “comfort zone” is also in line with some recently published paper in the Journal of Steroid Biochemistry and Molecular Biology in which Mohammed S. Razzaque highlights that “Vitamin D status is more likely to be a consequence rather than a cause of a disease” (Razzaque 2018). That magnesium may help keeping your levels within this “comfort zone” may hence be either the results of direct interactions or simply the consequence of the well-proven cardiovascular and metabolic benefits of getting enough of the precious mineral in your diet. Another reason to eat more chocolate… just kiddin’, although Dai et al. rightly point out that, in spite full-blown deficiency intakes in 79% of US adults (NHANES), sufficient amounts of magnesium can be easily consumed with our diet if the latter contains copious amounts of foods with high levels of magnesium include dark leafy greens, beans, whole grains, fatty fish such as salmon, nuts, avocados and dark chocolate! In this context, it seems appropriate to remind you that the overall result of the study at hand underlines the futility of the Western concept “more helps more”, which doesn’t seem to hold for vitamin D. In fact, it may well fail you when it comes to magnesium supplementation, too… and I am not just talking about magnesium (and other nutrient) losses due to the laxative effects of the Internet’s favorite macromineral, here (noteworthy in this context: 1st study on transdermal magnesium + Mg-bioavailability). From a mechanistic perspective, the interaction could be a result of the previously illustrated role of magnesium in vitamin D metabolizing enzymes: 1α-hydroxylase (i.e., CYP27B1) and 24-hydroxylase (i.e., CYP24A1), which synthesize and metabolize 25(OH)D and 1,25(OH)2D, respectively. In that, the study at hand is the first large(r)-scale study to (a) be done in people w/out severe Mg-deficiency and to (2) show that normalizing magnesium will not simply increase 25OHD, but seems to modulate it towards ~30-40ng/ml. This warrants mentioning that similar interactions do/could exist with calcium & phosphorus (Harrison 1958; Gray 1977), as well as potassium (Bikle 1978; Rafferty 2008) and salt (Breslau 1982). And guess what: One of them, i.e. calcium or rather a Ca:Mg ratio of ≥2.6, which has previously been found in >76% of the US general adult population, is also characteristic of the subjects in the study at hand – whether high Ca:Mg diets actually ’cause the vitamin D deficiency epidemic will yet have to be elucidated in future studies | Comment! Abraham, Paul S., et al. “The vitamin “D-bate”: what vascular risk in geriatric inpatients?” Journal of the American Geriatrics Society 59.8 (2011): 1556-1558. Bikle, Daniel D., and H. Rasmussen. “A biochemical model for the ionic control of 25-hydroxyvitamin D3 1alpha-hydroxylase.” Journal of Biological Chemistry 253.9 (1978): 3042-3048. Binkley, N., et al. “Assay variation confounds the diagnosis of hypovitaminosis D: a call for standardization.” The Journal of Clinical Endocrinology & Metabolism 89.7 (2004): 3152-3157. Breslau, Neil A., et al. “The role of dietary sodium on renal excretion and intestinal absorption of calcium and on vitamin D metabolism.” The Journal of Clinical Endocrinology & Metabolism 55.2 (1982): 369-373. Dai, et al. “Magnesium status and supplementation influence vitamin D status and metabolism: results from a randomized trial.” The American Journal of Clinical Nutrition, 108.6(1) (2018). Deng, Xinqing, et al. “Magnesium, vitamin D status and mortality: results from US National Health and Nutrition Examination Survey (NHANES) 2001 to 2006 and NHANES III.” BMC medicine 11.1 (2013): 187. Gray, Richard W., et al. “The importance of phosphate in regulating plasma 1, 25-(OH) 2-vitamin D levels in humans: studies in healthy subjects, in calcium-stone formers and in patients with primary hyperparathyroidism.” The Journal of Clinical Endocrinology & Metabolism 45.2 (1977): 299-306. Harrison, Helen C., Harold E. Harrison, and Edwards A. Park. “Vitamin D and citrate metabolism: effect of vitamin D in rats fed diets adequate in both calcium and phosphorus.” American Journal of Physiology-Legacy Content 192.2 (1958): 432-436. Harrison, Harold E., and Helen C. Harrison. “The interaction of vitamin D and parathyroid hormone on calcium phosphorus and magnesium homeostasis in the rat.” Metabolism-Clinical and Experimental 13.10 (1964): 952-958. Holick, Michael F. “Vitamin D status: measurement, interpretation, and clinical application.” Annals of epidemiology 19.2 (2009): 73-78. Kubiak, Julia, et al. “Vitamin D supplementation does not improve CVD risk factors in vitamin D-insufficient subjects.” Endocrine connections 7.6 (2018): 840-849. Rafferty, Karen, and Robert P. Heaney. “Nutrient effects on the calcium economy: emphasizing the potassium controversy.” The Journal of nutrition 138.1 (2008): 166S-171S. Ross, A. Catharine, et al. “The 2011 report on dietary reference intakes for calcium and vitamin D from the Institute of Medicine: what clinicians need to know.” The Journal of Clinical Endocrinology & Metabolism 96.1 (2011): 53-58. Tuohimaa, Pentti, et al. “Both high and low levels of blood vitamin D are associated with a higher prostate cancer risk: a longitudinal, nested case‐control study in the Nordic countries.” International Journal of Cancer 108.1 (2004): 104-108. Zittermann, Armin. “Magnesium deficit-overlooked cause of low vitamin D status?.” BMC medicine 11.1 (2013): 229.